I am fortunate to have friends with an extraordinary view of the city and was able to capture a series of photos in the evening sunset light - see more here. 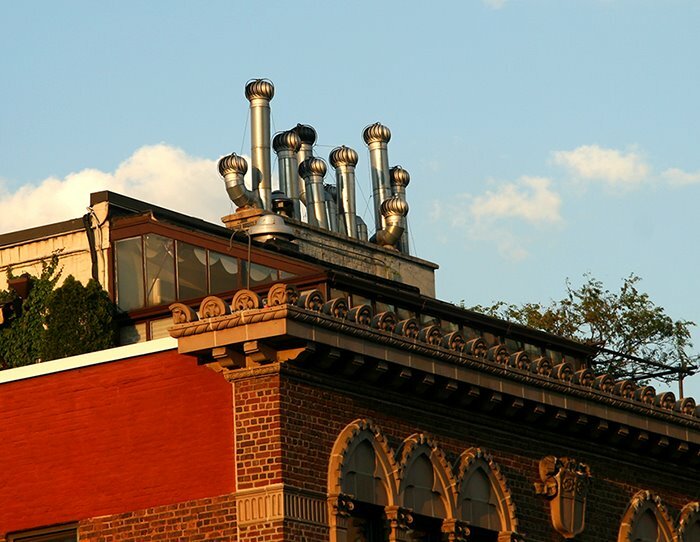 These rooftop turbine ventilators make a very visual accent the city's skyline. They can be seen everywhere in New York, along with the ubiquitous water tanks, which I have previously posted on - see here. In this photo, the ventilators are directly above what appears to be a penthouse apartment with a terrace. It may come as a surprise, but there are a number of people in Manhattan who have garden space and actually use landscaping services. These gardens are typically hidden from view - either at ground level in the rear of buildings or annexed to top floor apartments. Of course, a substantial premium is paid for this type of privilege, as is for air and views.